Paul the amazing chief at Automative Maintenance Solutions had diagnosed swine flu and felt so terrible he decided to head into the workshop just to fix my beloved Buzti Laroo, the red jeep. Not only that, but he met me at the car hire office at 8.15am so I wouldn’t have to take a taxi from (a) to (b), explained all the dodgy weird things that had happened to the car and sent me off for a bit of a drive with Zeus to check it was all tickety-boo before I hit the road. He also said it was ‘not a complete lemon’ and drove very well. Also, hooray to classic cover at the RAC snagging me a hire car! I posted details of my encounter with Paul and accompanying photo to a Facebook group called Rolling Solo for women travelling by themselves and it garnered more than 200 likes and countless positive comments. For two days of work, including a new water pump, thermostat, clutch fan, a few clamps and re-bolting the radiator back into the car (apparently it was holding on by a single thread) it was priced about 1/3rd the price Osborne Park Jeep charged me for a similar amount of work. 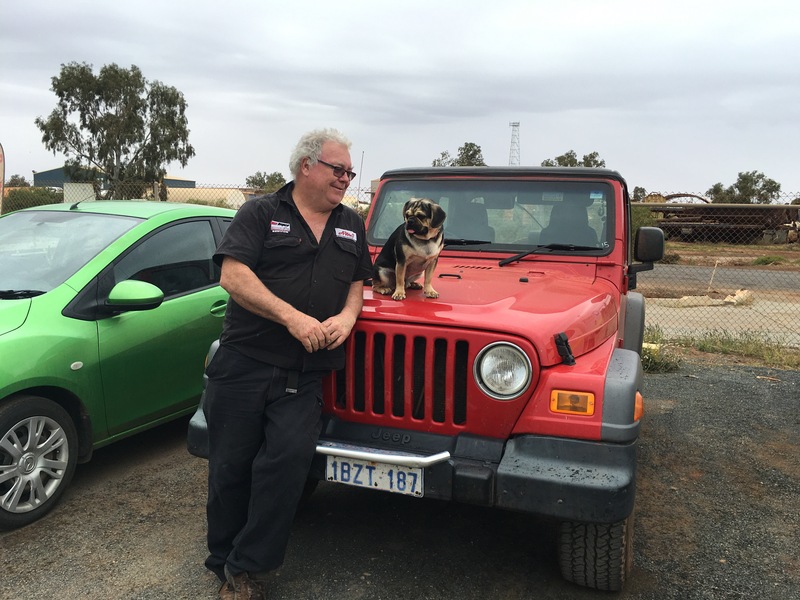 I’m glad I talked him up so much because I later met another couple who had been stranded in Port Hedland for a similar amount of time and Paul had been the only mechanic who had been (a) kind and (b) helpful. More about them later. 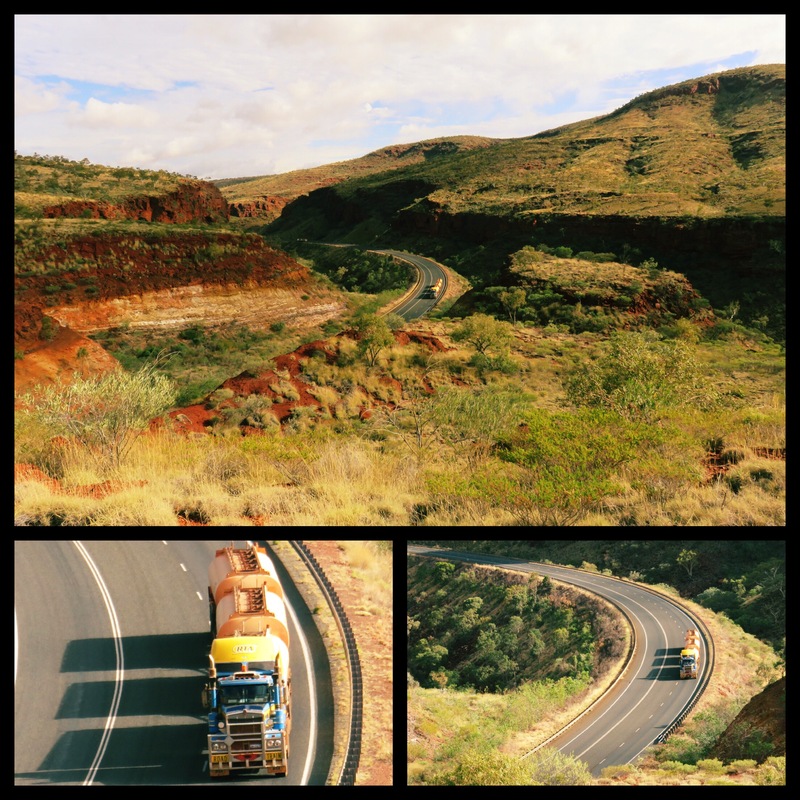 Both Paul and the tow truck driver regaled me with tales of what Port Hedland once was – something like 16,000 people have left the town since the mining slowdown, and countless thousands of shipping containers worth of stuff has been sent back to Perth. Vinnies ended up with so much donated stuff, it had to extend the property. And so, after six days enjoying the sights of Port Hedland (see Groundhod Day post), Zeus and I pointed the car South and hit road. Zeus was so happy to have his car back that without prompting he jumped straight in and climbed into his travel spot, much to the amusement of Paul. Jarvo had mentioned a spot out of Newman called something that sounded like a pasta, suggesting it as an overnight stop. 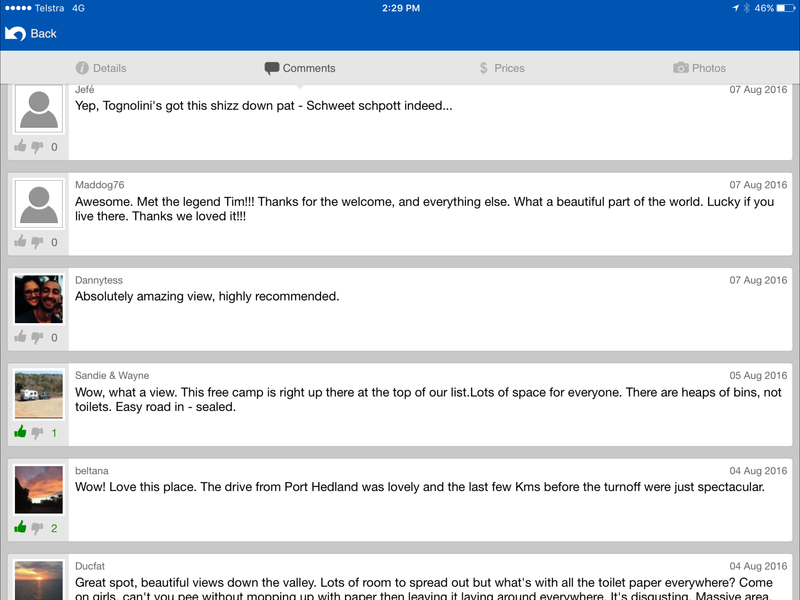 I hadn’t thought much of it until about two hours out of Newman the campsite I had intended to stay at came up… And it turns out it was called the Albert Tognalini Rest Area, named after an engineer heavily involved in the design of the Newman-Port Hedland road. Brilliant minds, Jarvo! This is just one small stretch of the highway which cuts through Manjuna Gorge, carefully engineered in the mid 80s to minimise environmental and cultural disruption. It would have to be one of the best kept secrets drive-wise in Australia, if not the world. Unlike many, I found the road trains no bother and actually very helpful – indicating when it was safe to take over, and generally driving courteously. 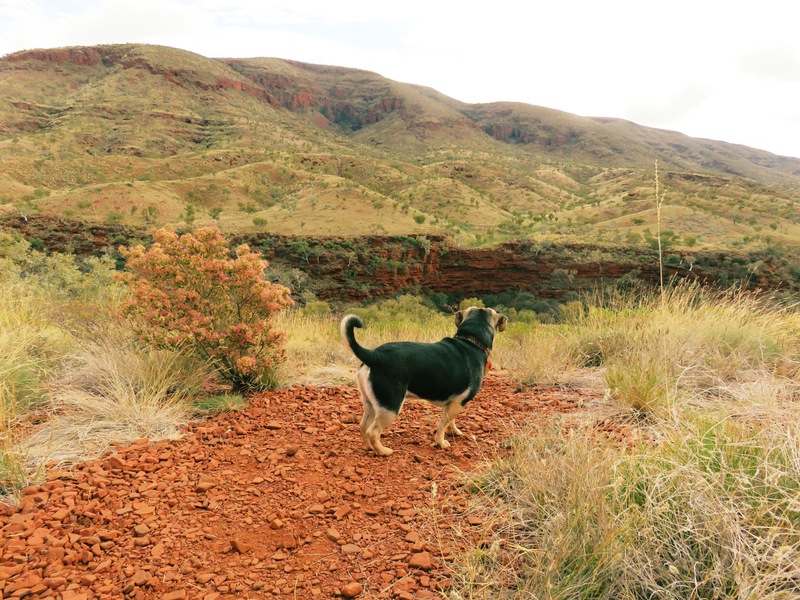 Anyway, the Albert Tognalini rest area was huge and most it it looks out over the gorge, not the road, so after a bit of a stroll around we picked a spot and set up, then wandered around all the camp sites so Zeus could meet everyone, and thus not bark. This is actually quite a fun ritual because I also get to meet everyone and check out the view. I met these two adorable creatures, Jo and Michael. They were in a van travelling on the lead up to their one year wedding anniversary. Yes wedding. Like I said, adorable and in their early 20s. They had bought an old van that had previously been used to move a wheelchair. This had two up-sides: it was wired for a second battery which could use to run the fridge, and surely a hydraulic chair lift would go for a motza second-hand. Turns out the former, yes but the latter… Not so much. They got $10 from a metal scrap yard. Not even enough for two decent roadhouse coffees (but enough for a bottomless pit of Nescafé Blend 43 at Auski). 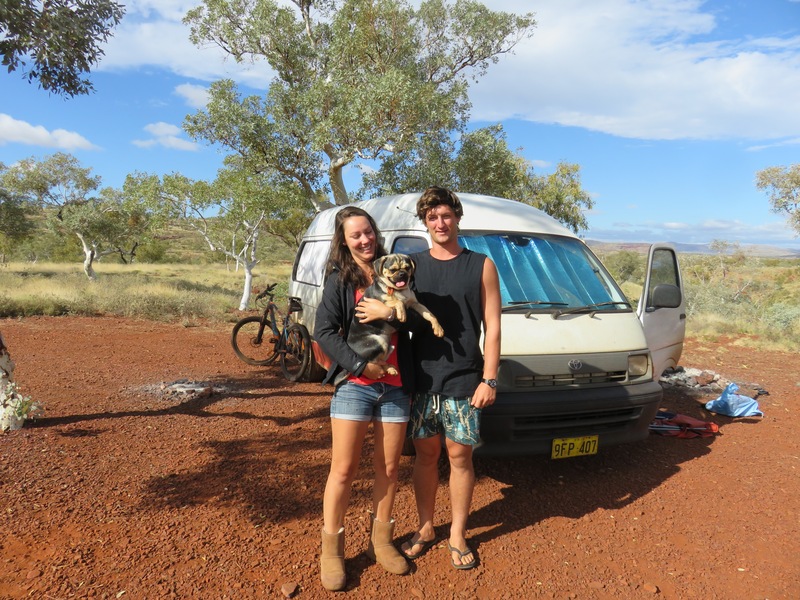 They too had been stranded in Port Hedland when the starter motor on the van gave up the ghost and for love nor money could they find anyone to help them…until they ran into Paul at AMS who helped them find a friendly auto-electrician to get them back on the road. Paul is also their hero. We discussed how to get him knighted or a sainthood or something. It was around this time Tim arrived. Tim is a local Aboriginal elder who each evening checks out the campground to have a yarn and teach some language and bush skills to whoever happened to be camping there. 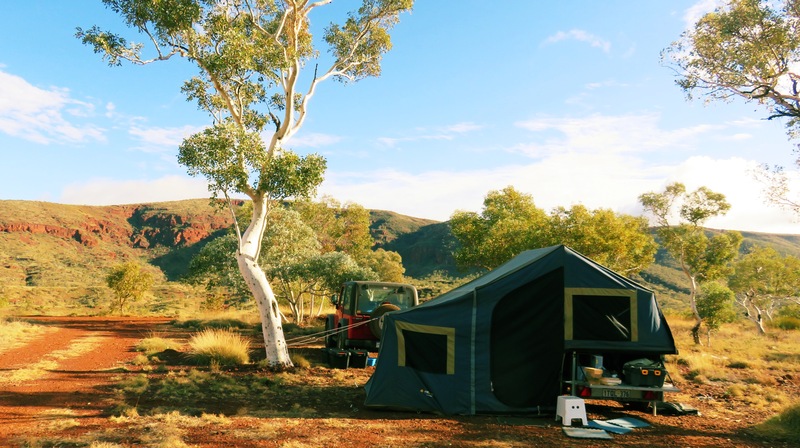 The previous evening he had met a family from Albany who were visiting Karijini and were parked up changing a tyre. I later discovered he gave them a leg of kangaroo to roast with strict instructions on how to do it, and a recipe, and took their youngest son on a bit of a 4WD tour down the gorge. He’s just that kind of guy. He even gets a mention in the wikicamps reviews. Tim had no shortage of grief to give me about driving a Jeep – “this is Landcruiser country” he said – created a stellar campfire with impressive speed and ease, and told us a few yarns about his work negotiating with BHP and FMG on native title and land use. That said, it’s also kinda awkward when someone shows up with the best part of a kangaroo carcass in the back of the ute and announces “I just feel like listening to loud music and getting boozed” so we weren’t really sure how the night would progress. Tim had also brought with him a shiny four-wheeler he was hoping to show the guys from Albany and see if the young bloke would like a run up the gorge tracks. Sadly, they had been out all day and didn’t get back until after dark. Tim left us after an hour or so of banter to content with what was now a roaring fire in roaring wind. Little scary. The following morning Zeus and I took it slow, just taking a few photos of the gorge before we set out. We had been planning to just head to Newman, but after lunch at the famed Purple Pub, it became evident the town was going to get loud on a. Grand final weekend so we made tracks and camped off the highway en route to Meekatharra, where I’m writing this. I keep finding rocks I want to bring back for my garden. TC when I’m back up this way, I’m coming to visit with a big tub to collect rocks! Meeka is very much closed on a Sunday… We’re at the only open servo in town and it’s been a constant stream of people coming in. 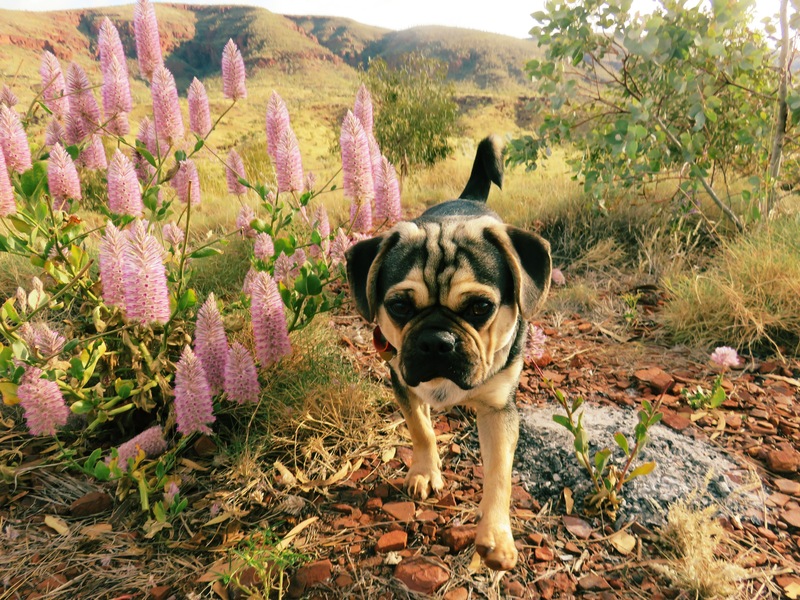 Zeus has delighted a great many kids, many speaking language and who have never seen a pug-like dog before. Probably going to head out to something called “Peace Gorge” to camp the night and head to Mount Magnet tomorrow, where apparently there’s another indigenous art gallery. Have you come across old Ernie the dogger from Meeka? What a lovely message to get, thanks Sandra! !